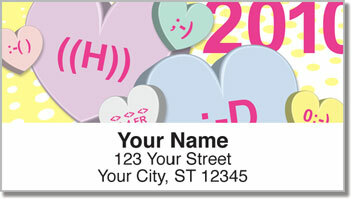 Here's a sweet finishing touch for your letters and packages - especially around Valentine's Day! Colorful heart-shaped candies have always been a fun way to show some affection. But on these labels, we've replaced the usual sappy sayings with amusing catch-phrases from decades gone by. Take a look and see if you've used any of this lingo! The best thing about this product is how it will make your life a little bit easier. No more writing out your return address by hand! 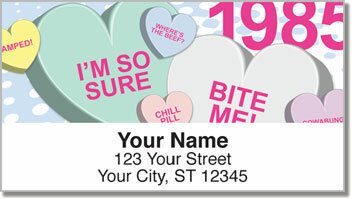 A self-adhesive backing lets you peel and place a label on each envelope you stick in the mail. Get your very own Candy Heart Address Labels from CheckAdvantage now! 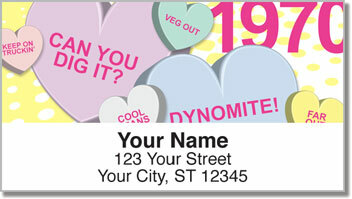 Matching check designs are also available.